Karnataka State Council for Science and Technology (KSCST) is actively participating in the socially relevant, environment friendly water conservation measures and has been providing cost effective solutions since its inception. Rainwater Harvesting (RWH) Cell at KSCST is established to study the needs of the people and provide sustainable and simple solutions through innovation and implementation pertinent to Rainwater Harvesting and Ground water recharge. Since November 2005 RWH Cell has provided technical support for planning rainwater harvesting systems in over 300 institutions (Public and private sector, Multinationals and Educational Institutions) in Karnataka and other states. Several thousand visitors have personally visited KSCST and availed the benefit and technical knowledge on RWH, water conservation and ground water recharge. 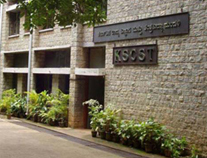 RWH cell established at KSCST is providing policy support to the Government departments for water conservation and rainwater harvesting programmes in Karnataka and other states in India. The guidelines established by RWH Cell are instrumental in pursuing State Government to amend several acts and issue guidelines for mandatory installation of RWH structures in all the government buildings, public parks, roads and open spaces. Bangalore Water Supply and Sewerage Board (BWSSB) has collaborated with RWH Cell of KSCST and brought in the legislation to compulsorily install RWH system in certain category of properties in Bengaluru. Quiz and Debate programs are organised to build awareness among students and faculty of schools and colleges. Over sixty five Quiz and Debate programs were conducted in Schools and colleges between October, 2013 and February, 2017 at sixty five Private and Government High Schools and Colleges in Bengaluru. This program has benefited 15,000 students and around 300 school teachers who participated in Quiz. The programmes were organised with the cooperation of over 150 volunteers from Nisarga Mahila Samaja. Technical support and interaction is being provided through, email, web site information, facebook, blog and Do It Yourself RWH web and android based app supported by UNESCO.